I’m sure you’ve heard of surfing. You’ve probably even heard of body boarding. But have you ever heard of sand boarding? Don’t worry, a lot of people haven’t either. This fun and dangerous extreme sport actually has a good reputation in several parts of the world and is enjoyed by thousands of adrenaline junkies. With that said, what exactly is it? Sand boarding is very similar to snowboarding. The only difference is that instead of going down a snow-covered mountain, you are soaring down a sand dune. While deserts are the most prime area for this sport, beaches and other coastal areas are popular locations too. Some people like sand boarding with both feet strapped to the board- the braver souls use boards with no straps to experience a better thrill. However, doing it this way is considered very dangerous. One of the few flaws about sand boarding is getting back to the top of a hill once you ride down. Remember, they have yet to build ski lifts in the middle of the desert. That being said, your only options are walking back up the dune (not ideal on a hot day) or riding a vehicle designed for the terrain. However, sand dunes aren’t seasonal. They produce ideal conditions all year long whereas snowboarding only takes place during the winter. Since the terrain is generally much rougher, sand boards are much harder than your traditional snowboard. To help glide through the sand and reduce friction, they are waxed on the bottom right before the run. Although it varies, the best wax you can use is paraffin-based (designed for sand boards). Most of the terrain boards are made up of hardwood while your typically, “full-size” sand board consists of wood, plastic, and fiber glass. 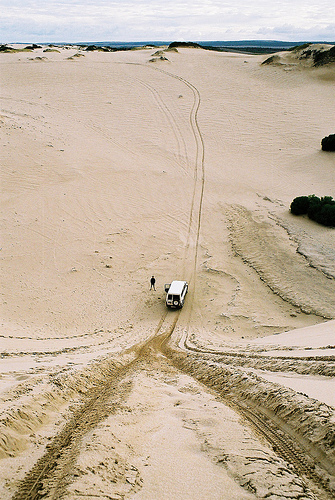 South Australia (Little Sahara) has a huge sand dune, roughly the size of two square miles. Each individual dune is different in size but overall, they are about 80-feet above sea level. There is a location called Lucky Bay which is located about 30 miles to the south of Kalbarri (Western Australia). 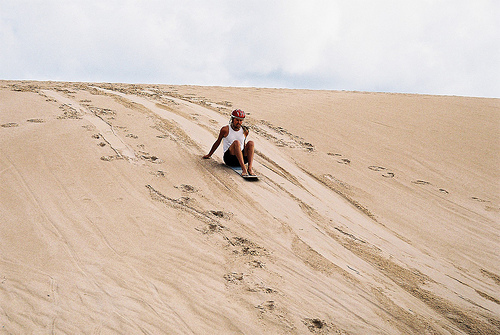 Here you can actually find sanctioned sand boarding tours. If you drive about 2.5 hours north of Sydney, you’ll run into the Stockton dunes. This area boasts a 1-mile wide, and 33-mile long boarding area. This enormous sand dune easily reaches 50-feet above sea level. 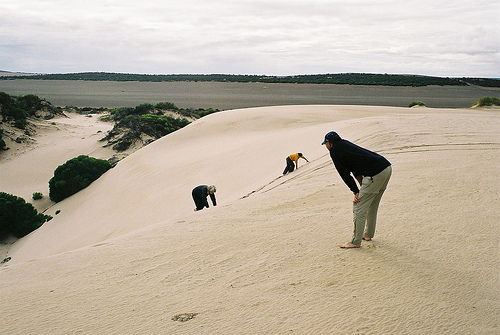 It is considered one of the largest and most popular sand dunes in Australia. There is a place called the ‘Great Sand Sea’, which is a popular sand dune in Egypt. This area also contains tons of other good locations like ‘Qattaniya’, ‘El Safra’, and ‘Hadudah’. Some people have been known to slide down pieces of wood since most cannot afford real sand boards in Egypt. 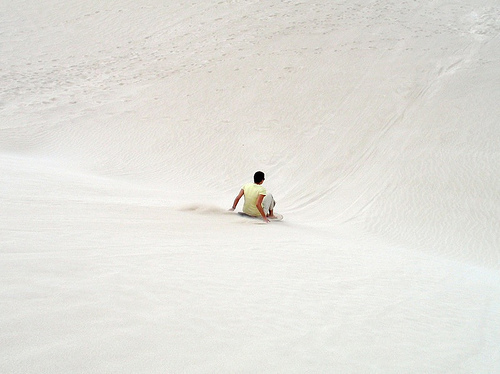 In the year 2000, South Africa established a sand boarding league. Competitors start battling against one another in 2001 and it’s been a non-stop rise in popularity ever since. Between 2002 and 2004, training camps were introduced to South Africa to teach others about this extreme sport. However, it collapsed for a couple of years and finally made a comeback in 2007. Needless to say, South Africa is a very, very fun area to sand board. Two men named Gary Fluitt and Jack Smith modernized and really brought out sand boarding in California during the 1980’s. Oregon has a place called Sand Master Park which happens to be the first sand board park in the world with 45+ acres of land, sculpted sand dunes, and a pro shop where you can buy gear and ask for assistance. It opened in 2000 and has steadily been attracting about 25,000 people per year. Each year there are about three sanctioned events which take place at Sand Master Park. This event is held every year in a place called Hirschau (Germany). Currently, it sits as Europe’s largest sand dune in which riders can soar down 300-feet and landing in water at the bottom. There is no greater adrenaline rush! It also has a sand life- the only one in the world of its kind. Events range from freestyle, to competitive racing, to a cross breed of the two. Every year in the month of July, both amateurs and professionals gather in various parts of Brazil and take place in freestyle and jump events. This epic sand boarding event definitely ranks in the top five of the world. Florence, Oregon has an area called Sand Master Park. This is easily the nicest and most well-kept sand boarding dune in the world. Besides offering pro shops and custom dunes, Oregon holds sand boarding competitions in the early summer of every year. This has been going on since 1996 and it still runs strong today. The name itself exudes excitement, wouldn’t you agree? This epic, three-day event takes place every year in September in the lovely area of Costa Mesa, California- during the Expo Center and Orange County Parade. This outdoor event hosts all kinds of sand sports including sand boarding (the most popular). An interesting and also very popular form of this sport (depending on where you are in the world) is volcano sand-boarding. The techniques and procedures are all the same except the terrain is a bit different….well, more than bit. Instead of sliding down a sand dune, riders are hurled down the side of an active volcano, using the volcanic sand to gain speed. Needless to say, this adds another degree of danger to an already dangerous sport (another plus for those looking for pure adrenaline). Do you think you’re up for the challenge? This entry was posted in Africa, Australia, Bizarre, Sand Boarding, Travel, United States and tagged Australia, Egypt, Sand Boarding, South Africa, United States. Bookmark the permalink.